Broncos: 1971 every home game; 1980 vs. Cowboys & Chargers; 1983 vs. Eagles, Raiders & Bengals; 2003 vs. Chargers (Shanahan Uniformgate). Cardinals: 1964 and 1965 every home game; 1966 vs. Cowboys and Steelers; 1967 vs. Giants, Lions, and Steelers; 1968 vs. Saints and Steelers; 1969 vs. Vikings and Steelers; 1970 vs. Cowboys and Patriots; 1971 vs. Cowboys and Eagles; 1972 vs. Steelers and Rams; 1973 vs. Redskins, Raiders and Cowboys; 1974 vs. Browns and Cowboys; 1975 vs. Giants and Cowboys; 1976 vs. Giants and Cowboys; 1977 vs. Bears, Cowboys and Saints; 1978 every home game; 1979 vs. Cowboys, Steelers, Redskins and Eagles; 1980 vs. Giants, Eagles, Rams and Cowboys; 1981 vs. Dolphins, Redskins and Cowboys; 1982 & 1983 vs. Cowboys; 1988 vs. Redskins, Steelers and Browns; 1989 every home game; 1990 vs. Redskins, Cowboys, Bears and Packers; 1991 vs. Cowboys, Patriots, Falcons, Vikings and Giants; 1992 vs. Eagles, Redskins, Saints, 49ers and Cowboys; 1993 vs. Cowboys, Patriots, Redskins, Saints and Eagles; 1994 vs. Giants, Vikings, Cowboys and Steelers (throwback uniforms); 1995 vs. Eagles, Chiefs, Redskins and Seahawks; 1996 vs. Dolphins, Rams, Bucs and Jets; 1997 vs. Cowboys, Vikings and Giants; 1998 vs. Eagles, Raiders and Bears; 1999 vs. Giants, Redskins and Patriots; 2000 vs. Cowboys, Packers, Browns, Eagles and Saints; 2001 vs. Broncos and Falcons; 2002 vs. Chargers, Giants and Cowboys; 2003 vs. Seahawks, Packers and Ravens; 2004 vs. Patriots (white pants), Saints and Seahawks; 2005 vs. Rams, 49ers (Mexico City they Cards were the home team), Panthers and Titans; 2009 vs. Texans. Chiefs: 1980 every home game; 2006 vs. Bengals (white pants). Cowboys: 1964-1969 every home game; 1970 every home game except SB V vs. Colts; 1971-2010 every home game except: 2001 vs. Broncos, 2002 vs. Redskins, 2003 vs. Dolphins, 2004 vs. Bears, 2005 vs. Redskins and Broncos, 2006 vs. Buccaneers and Eagles, 2007 vs. Packers, 2008 vs. 49ers, 2009 vs. Raiders, 2010 vs. Saints. Falcons: 1966 vs. Cowboys and Rams; 1967 vs. Redskins and Rams; 1968 vs. Colts and Steelers; 1977 vs. Rams; 1978 vs. Oilers and Browns; 1979 vs. Broncos; 1980 vs. Dolphins; 1981 vs. Saints and 49ers; 1982 vs. Raiders; 1983 vs. Giants; 1984 vs. Lions; 1985 vs. Lions and Broncos; 1986 every home game; 1987 vs. Redskins, Steelers, 49ers, Rams and Saints; 1989 every home game; 1997 vs. Raiders, Broncos and Eagles; 1998 vs. Panthers; 1999 vs. Ravens; 2000 vs. Giants and Panthers; 2002 vs. Bengals; 2003 vs. Vikings. 49ers: 1976 every home game; 1979 vs. Cowboys, Saints and Seahawks. Giants: 1967 every home game; 1980 every home game; 1981, 1983-1987 vs. Cowboys; 2000 vs. Cardinals. Lions: 1961 vs. Packers; 1970 vs. Raiders. Packers: 1989 vs. Bucs and Saints. Raiders: 2008 vs. Chargers; 2009 vs. Chargers (AFL Legacy). Rams: 1964-1971 every home game; 1972 vs. Saints and 49ers; 1978 vs. Falcons, Cowboys, Saints, Bucs, Packers, NFC DPG vs. Vikings and NFC CG vs. Cowboys; 1979 vs. Chargers and Raiders; 1980 vs. Cowboys; 1981 vs. Oilers, Browns and Falcons; 1982 every home game; 1993 every home game; 1994 vs. Cardinals, Falcons, and Giants; 2008 vs. Cowboys. 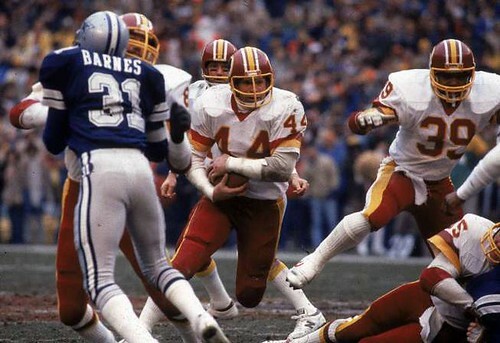 Redskins: 1964 every home game; 1981-2000 every home game except 1994 vs. Falcons; 2002 vs. Cardinals and Cowboys; 2003 vs. Jets, Giants (white pants in both), Patriots and Cowboys (burgandy pants in both); 2004-2007 every home game (’05 vs. Cowboys and Giants; ’06 vs. Vikings, Jaguars, Titans and Cowboys in white pants; ’07 vs. Giants in throwback yellow pants); 2008 vs. Saints, Cardinals, Rams, Browns (all with white pants), Cowboys (burgundy pants); 2009 every home game except vs. Broncos, Saints, and Giants. Steelers: 1964 vs. Rams; 1966 every home game except vs. Redskins; 1967 every home game except vs. Vikings; 1968 every home game except vs. Saints; 1969 every home game; 2005 SB XL vs. Seahawks. Vikings: 1964 every home game except only in the 1st quarter of their game vs. the Lions. If you prefer to see the white-at-home games broken down year by year, instead of team by team, here are the listings for 1964, 1965, 1966, 1967, 1968, 1969, 1970, 1971, 1972, 1973, 1974, 1975, 1976, 1977, 1978, 1979, 1980, 1981, 1982, 1983, 1984, 1985, 1986, 1987, 1988, 1989, 1990, 1991, 1992, 1993, 1994, 1995, 1996, 1997, 1998, 1999, 2000, 2001, 2002, 2003, 2004, 2005, 2006, 2007, 2008, 2009, and 2010. 1) All indications are that no AFL team ever wore white at home (the Broncos wore yellow at home in 1960 and 1961 but wore white jerseys for away games). However, the Raiders wore white at home for a preseason game vs. the Chargers in 1967, and the Chargers and Oilers donned white at home for preseason games in 1968 and 1969. 2) The following teams wore their white jerseys for a whole season (preseason games not included): Browns: 1972 (but wore brown jerseys for division playoff game in Miami), 1973, 1977, 1986, 1995; Buccaneers: 1976; Chargers: 1978, 1982 (but wore blue for a playoff game against the Dolphins), 1983, 1991; Cowboys: 1972; Dolphins: 1977; Oilers: 1998; Rams: 1968, 1969, 1970, 1993; Saints: 1974. 3) There have also been several games with no white jerseys. Here are the instances of color vs. color jerseys since 1957: 1957: Rams (yellow) at 49ers (red), Rams (yellow) at Lions (honolulu blue), Rams (yellow) at Bears (navy); 1994: 49ers (red) at Rams (yellow), Rams (yellow) at Chiefs (red); 2001: Broncos (orange) at Cowboys (blue); 2002: Patriots (red) at Lions (honolulu blue), Redskins (burgundy) at Cowboys (blue); Vikings (purple) at Saints (gold); 2003: Cowboys (blue) at Patriots (silver), Dolphins (aqua) at Patriots (silver); 2004: Bears (orange) at Cowboys (blue), Bengals (black) at Patriots (silver); 2005: Chargers (navy) at Patriots (silver); 2006: Texans (navy) at Patriots (silver); 2007: Bills (dark blue) at Patriots (silver); 2009: Cowboys (blue) at Chiefs (red); and 2010: Patriots (red) at Lions (honolulu blue).